Eating in Italy is one of the great pleasures of traveling to this country and we took this activity seriously! We had at least one big feast a day, which typically lasted around three hours, with several courses and sometimes an apertivo (before dinner drink), dolce (dessert) and a cafe or digestivo (after dinner drink). And of course wine is a staple of every meal! So how did we manage to eat all this and not come back as contestants for The Biggest Loser?... LOTS and lots of walking ... and only ONE huge meal a day. The others were small! 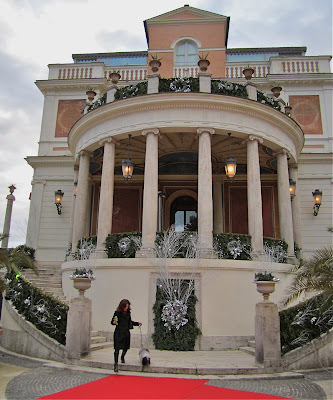 On our first day in Rome, we strolled through the beautiful Parco della Villa Borghese and headed to Casa Valadier for lunch. High above the Piazza del Popolo, this 19th-century cafe is a most lovely place to enjoy a leisurely lunch and a spectacular view of Rome. We entered through a colorful hallway, where famous guests from Gandhi to Mussolino had visited before us. Sitting down for lunch. That means EVERYBODY gets to sit down for lunch! Having cultivated civilized society for a thousand years longer than us, the Italians allow dogs to respectfully join their owners in public more often than not. ... and a traditional "ceci" (garbanzo bean) soup with fried baccala (salted cod). 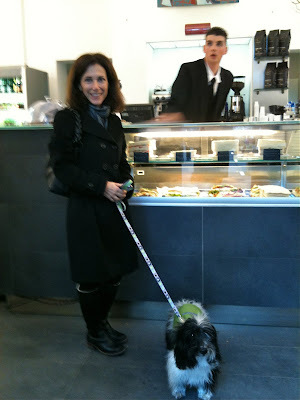 Our secondo... we shared a French rack (lamb chop) served cacciatora style with artichoke omelette and potato gratin. Yum! Sharing entrees leaves room for dessert! This was a departure from a traditional Zabaglione, or so I am told, but it was worth every bite of creamy custard goodness! The chocolate crunchy bits on top and hazelnut shell offered just the right texture to complement the fluffy mousse-like custard. Yum! Yum! Note: If the weather is not warm enough to sit on the terrace outside Casina Valadier, reserve table 19 for the most prominent view in the dining room. And finishing the meal in traditional style with a caffè. 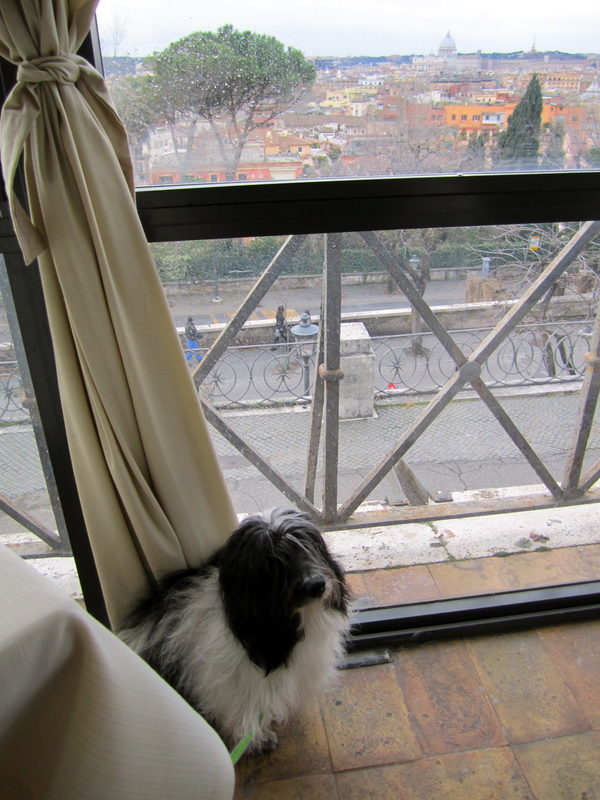 Even Cosmo admired the view ... and the secondo they were serving at the next table! After lunch we walked through the park and found Casina del Lago, a nice spot for lighter meal. We returned here the next morning for breakfast. At Casina del Lago we had very pleasant breakfast of cappuccino and brioche. And of course, Cosmo was welcome too! Next up, seeing the sites of Rome! What an amazing trip! The view from your table was breathtaking...so awesome that Cosmo was allowed to join you. what a great food for lunch and a nice view also of the surrounding.. I finished reading this post and I turned to my husband and said, "I can't wait until we can take our pups to European restaurants." It's one of the things I am MOST excited about. 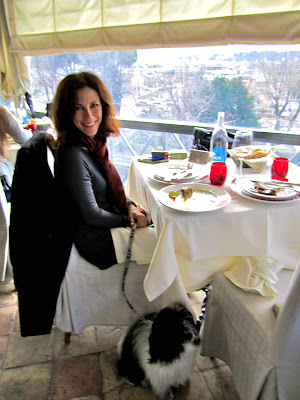 When we were in Tuscany, we went to this very nice restaurant and, inside the restaurant (that is, not on the patio), they allowed a woman to bring in her three Shih-Tzus. Hi! I discovered your blog today. My husband and I have now a little french bulldog puppy and I started researching for people who travel with their dogs, since we like to travel a lot. I found your blog amazing and I in love with your little Cosmo! This travel to Italy is wonderful! I hope we do in a very short time. Our little Maquiavel is only 2 months old now, but I hope we can do it next your, by february. Congratulations for your beatutiful puppy!